It was in Germany that dwarf hotot rabbit was born and it was breed with the combination of the dwarf netherland bunny and REW. The stocky built rabbit are becoming popular in the USA. There are many people who are interested to keep the hotot as pet. However, before you start going to pet stores, it is better for you to arm yourself with a few tips how to choose the rabbit from Germany. If you are planning to buy the hotot rabbit then you should look for pet stores that are considered as trustworthy. You should never buy pet from illegal vendors because there are many sick pets being sold by them. There are cases that the rabbits have been found dead after a few days at the new home. The dwarf hotot rabbit is about 3 pounds and it small size makes it adaptable to live in confine space. It needs a small cage that has room for it to exercise. If you let it play outside the cage, make sure there is no dangerous item lying around. The hotot rabbit has been known to be a mischievous little creature which can hurt itself. The rabbit is an intelligent animal and it can be trained to do simple tasks. The hotot rabbit understand simple command and can also be trained to use the litter box. The rabbit is easily to become attachable to it owner and human interaction is very important for the little bunny. When you are trying to buy the hotot rabbit, you should observe the body of the rabbit. Choose a rabbit that is not thin or fat. Checking the teeth will also be good. Buy the one with small and short teeth. The skin of the rabbit should also be checked for cuts and wound. You can do this by stroking the fur. The rabbit buttock should also be examined, if there is liquid discharged then you should avoid it. The nose and surrounding area must be clean and free of scale. Another important point is to checked for the breathing, a calm and slow breathing is a signed of healthy rabbit. When buying the rabbit from a pet store, you should avoid buying a rabbit that has been placed in a congested cage. Congested cage will cause the animal to be stressful. The dwarf hotot rabbit will also need good diet to help it live longer and healthier. Fiber is one of the important elements that are needed by the hotot rabbit. It digestive system needs fiber to be healthy. You should feed the rabbit with fresh fruits and vegetables. The dwarf rabbit may look small, but it can eat a cup of pallet daily. However, the best food for the rabbit is fresh foods and pallet should only be given as supplement. 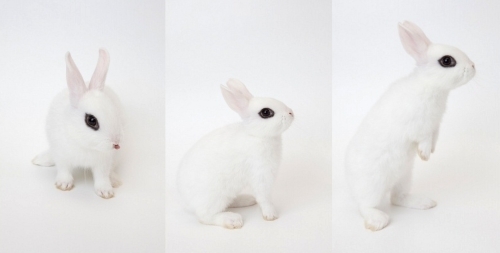 The internet is the best place for you to learn about caring the hotot rabbit. You can also buy pet books on caring hotot dwarf rabbit from online stores which is great way for you to learn about the dwarf hotot rabbit.